Cornbread has fast become one of our family favourites. When we were in Florida a couple years ago, we ate at this one restaurant, Rosie’s BBQ, twice in the 9 days we were there. Both times, we ordered the freshly made cornbread. It was amazing! Definitely a side you want when ordering BBQ in the south. The first time I made cornbread, I used beer in the recipe. They tasted great, and complemented the roast beef dinner Wendy made quite well. Rachel and Lauren wanted to help me make cornbread that didn’t use beer. As well, this was our opportunity to try some different ingredients. 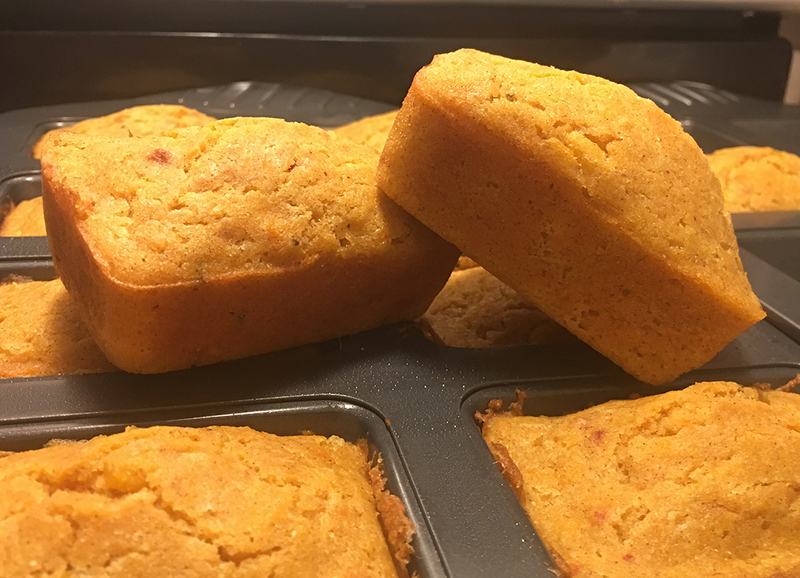 So, we decided to try our hands at cornbread mini loaves. The first step was buying the mini loaf trays. Wendy had mentioned she saw them at Walmart the last time we were there. So off we went to buy the mini loaf trays. Next, we needed a recipe. The girls helped me modify the beer cornbread muffin recipe we made to exclude the beer, but include buttermilk, which is often used in making cornbread. We estimated, so we were hoping the cornbread mini loaves would come out. They also wanted to add cheese, so we picked up a Tex-Mex grated cheese blend. As well, we decided the cornbread mini loaves needed more of the sundried tomatoes, and that the corn needed to be chopped up this time. Well, here is the recipe we came up with. Preheat oven to 400˚F. Lightly grease mini loaf trays with cooking spray. I used 2 trays with 8 mini loaf slots in each. In a large bowl, beat the eggs with a fork. Stir in the buttermilk, and the melted butter. Once mixed, stir in the corn, shredded cheese, and diced sundried tomatoes. In a separate bowl, mix the dry ingredients together (flour, cornmeal, brown sugar, baking powder, baking soda, paprika, nutmeg, salt). Slowly add dry ingredients to the wet ingredients, stirring them in until completely mixed together. The batter will be lumpy. Divide evenly into the 16 mini loaf slots – they will be almost full. Bake 15-20 minutes until golden brown. Insert a toothpick into the centre. If it comes out clean, they are done. Let cool for a few minutes. Remove from pan. Serve warm. Yields 16 buttermilk cornbread mini loaves. They turned out amazing! Everyone really enjoyed the taste and the texture. This is going to be our go-to recipe for cornbread! If you try this recipe, let me know how it turns out.